Last time I blogged, on Wednesday, I said it was a fairly uneventful day, hit Send, and promptly a 12 hour rainstorm started that flooded our tent. Today really was uneventful, and very enjoyable too. As we're getting nearer to Medellin we're starting a transition from turning out the miles to vacationeering mode. 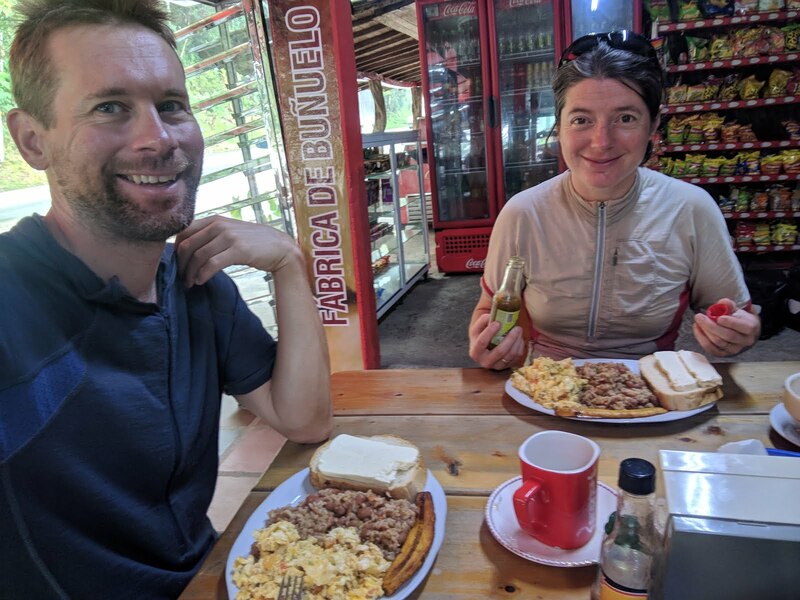 This is because we've allowed double the time allowance for the return, and it will be via some more classic gringo trail destinations in the "zona cafeteria" (coffee growing region). Last night's trunk stop hospedaje was probably the most basic we've been in yet, but no less hospitable for it. In fact I think we enjoyed it as much as anywhere. We splashed out on 2 rooms for the night, one for us, and one for the soaked tent to dry in. Unfortunately overnight so much water came out the tent that there was a significant puddle under the door and running down the tiled hallway. We quickly mopped that all up and like to think might have cleaned it too, packed up the gear and went down to the roadside feeding area. The proprietor was there looking same as when we'd retired after dinner last night, and geated us enthusiasticly and carefully described the breakfast menu in simple words and gestures we could follow. Soon we had a formidable plate of "the usual", eggs, rice, beans, bread and cheese. Grand total of $25 usd all in for 2 meals, four beers and 2 rooms for the night. This put a heavy weight in our stomachs for tackling the first 30km of the day, all steadily uphill. At least we no longer had 4 extra kilos of water in the soaked gear! As we climbed we passed seemingly hundreds of roadside Lavados like we'd been seeing for the previous 2 days but in lesser numbers. These are roadside truck washes. The MO is find a stream above you house, dam it a bit a run long length of hose down, presto unlimited water supply for vehicle cleaning. The hoses run permanantly, hung up as fountains beside the road when not needed as a sort of advertisment. The same hose lines will regularly supply the fresh water for the house, and the collection resevoir makes a nice plunge pool for all the family (or hotel guests, in a couple places we saw). 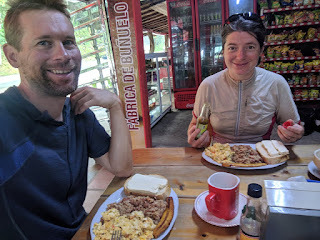 Eventually we summited the pass Alto Bonito, stopped for our 3rd drink break of the day, and started the 5km of descent and 30km of flatish Altiplano riding to our hotel stop for the day. This summit really marked a transition from rural highway to urban riding. The closer we'd got the more affluent looking cars and restaurants we'd seen along the road, like we'd not seen since Zipaquira on Sunday. Along with the urbanization is an increase in range of hotels available, meaning cheap hospidajes are more likely to be genuinely seedy, but on the flip side we're now back in booking.com coverage so I found us a fancy hotel in a colonial style building as a $40 extravagant treat. We got in just after 2pm so got some laundry done and made a relaxing afternoon enjoying first hot shower in a while, and drinking beer on our Cabaña porch. A thunderstorm is just rolling in now, third in as many nights but we've been very fortunate in not have any noteable rain to deal with during daylight hours. Long may that continue! 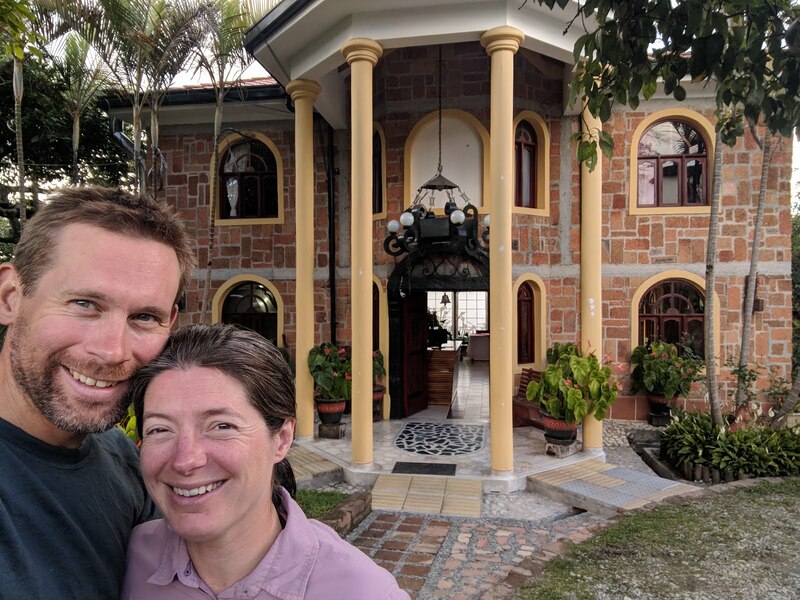 Colombia day 19: Ups and downs, lots of downs! Colombia day 3: Look Dobbin, mountains!